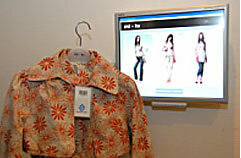 Schmidt RFID Smart Retail System (SRS) offers an RFID-based smart dressing mirror for customers. The basic idea of the Smart Retail System is that it uses RFID tags to make trying on clothing a bit faster and more convenient for customers. This innovative smart dressing system offers real-time mix-and-match style advices to customers when they view their selected fashion items in front of a dressing mirror or try them on inside a fitting room. It can also customizes the recommendations by using specially developed programmes, including a virtual try-on simulator to fit the product image onto the body figure of the customer, an intelligent fashion mix-and-match engine for emulating fashion designers in mixing and matching fashion items, and an intelligent VIP engine for customizing mix-and-match suggestions to individual VIP based on his/her previous purchases. The system, enabled by Radio Frequency Identification (RFID) technology, has strong potential to assist fashion retailers to improve their overall services and link up with the backend operations. Our customers find that the instant suggestions and wider choice provided by the SRS systems make shopping easier and more satisfying, said Katherine Ho, Managing Director of mi-tu. With the Smart Fitting Rooms and Dressing Mirrors in our stores in Hong Kong, we can now increase sales by 30 percent while improving customer satisfaction through the use of exciting new technologies. In Vernor Vinge's excellent 2006 novel Rainbows End takes this augmented reality idea to the logical extreme. Everyone makes use of "wearables" - wearable computers that present them with a continuous augmented reality view of the world. In the novel, a person could have accomplished this by looking in the mirror; the wearable computer system augments your view by means of smart contact lenses. Update 09-Jan-2009: I found a pretty good reference for this idea in a 1965 Harry Harrison novel. See the entry for personalized fashion display - it's quite a recruiting aid. End update. 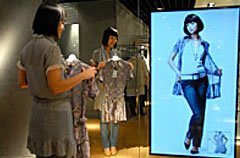 Be sure to look at Augmented Reality Shopping in Osaka, an earlier related story. Read more at SCHMIDT RFID debuts world’s first RFID Smart Retail System in Hong Kong creating a new era for retailing and at the Schmidt RFID website.